I’ve stumbled across another commemoration of interest to me. I have no idea who names these “official” dates, but they succeed in focusing some public attention on their distinctive topic. 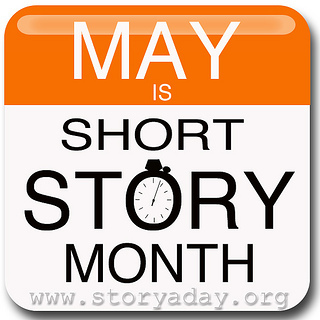 This one is Short Story Month, which, in case you don’t know, is May. A short story is, by definition, fiction. It drives me crazy to hear wanna-be writers describe a work as “a fiction short story.” Don’t need the term “fiction.” Still, better to talk about short stories than not, even with a superfluous word. Superfluous words are what short stories don’t have. They enable us to read tales about imaginary people, events, locations minus the length of novels or novellas. Why does this appeal? As we become more inundated with electronic media, videos, selfies, instant photos, self-published discourses, and every form of communication ever dreamed of, some of us feel we’re losing control. Our time is not our own. But short stories abbreviate their length. While writers hate to be limited by rules or even guidelines, short stories are, indeed, shorter than novels. They still have characters, settings, themes, and conflicts. Some have mystery, romance, puzzles. So they have essentially everything a novel can have but in a manageable amount. I’ve heard of book clubs whose members are so strapped for time, they’ve turned to only reading short stories. The best writers in the world have created short stories. They’re handy to read when you’re traveling and are squeezing in some recreation on a trip. It’s easy to be introduced to a new writer in a short story. Their succinctness has an appeal all its own. Another favorable point: publishers and publications are starting to post free online short stories to encourage readers to sample their wares. The day when a writer could actually make a living writing short stories is long gone. The market, however, is still strong, if you don’t mind creating for extremely low pay or, even more likely, none. Literary journals are the home for most. If you’re interested in my short stories, I have links on my website to some you can read. Take some chunks of time this month to sample new short stories or re-visit old ones. “The Lottery” by Shirley Jackson, “An Occurrence at Owl Creek Bridge” by Ambrose Bierce. “The Tell-Tale Heart” by Edgar Allan Poe, the list is fascinating and apparently endless.